Effective meetings don’t just happen; they are carefully planned. By taking the time to set up and prepare, you are actually investing in the outcome of your meetings. The key is to create an environment that is both stimulating for your participants and ordered enough that it keeps people focused and alert. In this blog, we’ll take you through 8 of the many, many things you can do to make sure your meetings are a success. After all, there’s nothing worse than wasting time and not growing your business. The first thing you need to figure out is when to have your meeting. Don’t leave this to the last minute; think long and hard about this and the implications it has on your meeting and the overall productivity levels of your participants. Organising a meeting first thing in the morning can be problematic, for example, as people may be stuck in traffic or still getting organised. Meetings late in the day can also provide issues, as people may already be thinking about their evening or other things. After all, the last thing you want is a meeting full of clock-watchers. By setting meeting times that work for your business, you’ll be able to ensure that everyone is present and on the ball. Although choosing the right venue is sometimes restricted by the time you select, it’s probably just as important. Don’t turn into one of those people that is still frantically looking for a meeting place 10 minutes before the meeting is set to start. Take the time to select a meeting room and make sure that this will keep people focused. Hot, cold, windy, stuffy – there’s nothing worse than being stuck in a room that isn’t comfortable. Make sure that you have it all figured out well in advance so that people can focus on the task at hand. We recommend our off-site meeting room solutions, as they have been perfectly tailored with your productivity in mind. The less people in a meeting the better. Not only will this foster a feeling of responsibility, but it means people will pay attention and avoid zoning out. Furthermore, by limiting the participants, you are making sure that the scope of your meeting isn’t too general and that it has a very specific target in mind. Plus, the less people are stuck in meetings, the more work they can get done. Make sure you have a good idea of what bases you want to cover before starting your meeting. Not only does this set a good example, but it means people will know what to expect in future meetings as well. Leaving time to address major action points at the end of your meetings is always useful and will allow people to assign responsibilities so that your meeting has quantifiable outcomes. If you build a reputation as someone who doesn’t care whether they start on time or finish on schedule, people will probably do the same. Your goal should always be to foster an environment where people show up to the meeting 10 minutes ahead of time to prepare and make sure they are all settled in. That way, everyone is ready to make the most of your meetings. Don’t be afraid to set rules and limits. If you don’t think it adds to the meeting or distracts, then make sure people are aware of that. Eating, for example, is not only distracting, but also looks unprofessional. Identify the things you will and will not allow in your meetings and stick to them. Leave a little time at the end of your meetings so that people can ask questions and more importantly, so that any unexpected issues can be resolved without having to schedule another meeting. You don’t want to come across as a dictatorial delegator by talking for a whole hour; instead, you want people to feel comfortable sharing their ideas and questions. There’s nothing worse than stuffy boring meetings. Make sure to engage your participants. Having quickfire brainstorming sessions or making large mind maps using post-it notes can help to get the creative juices flowing and often creates unexpected results. It also helps settle people in and means that people can contribute with their own ideas. 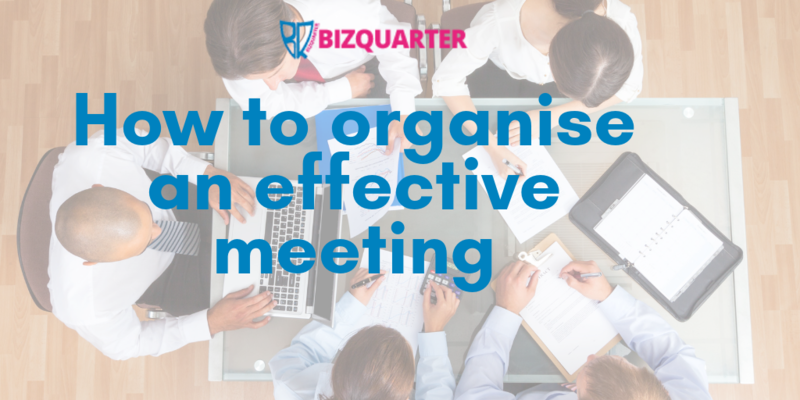 For more business and meeting tips, check out our other blogs or get in touch with Bizquarter to book your next meeting room.